Most drivers encounter parking problems every day. This is especially true with new types of vehicles that have horrible blind spots as if we don’t have enough problems with parking in crowded cities. However, there is a device that makes this process easier. A parking sensor is an amazing little device that helps you park your car perfectly. It features sensors that measure the distance between your vehicle and the object behind it, warning you when you get too close to the obstacle. This way, you’ll be able to slowly park your vehicle and avoid dangerous collisions. Whether you’re searching for an aftermarket parking sensor or you don’t have one at all, you want to find the best product out there. A parking sensor is a very useful device that will make your life easier, but it’s important to pick the perfect one for your vehicle. Searching for the best parking sensor is a challenging task that requires a lot of time. We wanted to make this task easier for you, so we provided a list of 10 best parking sensors. Hopefully, it will guide you and help you find the perfect product for your needs. Zone Teck parking sensor promotes safe parking by detecting objects behind your vehicle. You’ll be able to park your car perfectly in the parking lot or in your garage while keeping everything and everybody safe. If you're interested in this product, keep reading to find more about its high-quality features and materials! The Zone Tech reverse radar system is equipped with 4 sensors that go to your car’s rear bumper. It has a double CPU and advanced chipset for enhanced coverage and better detection. The device has an audible sound system that emits a loud beep sound to notify you about the distance between your car and the obstacle. There is also a three-colored LED display with 7 indicator levels that will show you how close you are to the object. The green is the safest color, the yellow means that you’re getting closer to the object, while the red one is the last warning to hit the brake! Zone Teck parking sensor is made of quality materials that provide excellent performance and durability. The components are thoughtfully chosen to prevent potential overheating during extended use. Additionally, the parking sensor has an Adaptive Environment Technology - sensors are weatherproof, and they won't freeze during harsh weather conditions. The assembling part is quite easy, you need to drill 4 little holes on the rear bumper in order to set up 4 ultrasonic sensors, and that's about it. However, some users complained about wires being too short to fit every type of vehicle. One of the best parking sensors on the market is also among the cheapest ones! We were quite surprised when we discovered that one first-class parking sensor like Zone Teck comes with an attractive price. Don't hesitate to try it out because it definitely provides incredible value for money! If you’re searching for a versatile parking sensor that fits cars, trucks, and SUVs, we have the perfect one for you! With Hopkins sensor system, you’ll be able to prevent dangerous and costly collisions that can occur due to the limited visibility. The sensor offers high-quality features and excellent performance that will improve your parking abilities and promote safe driving. This sensor system contains ultrasonic sensors mounted at the rear bumper and an audible alarm that goes inside the vehicle. An alarm will inform you when you’re getting too close to the object behind your vehicle – it starts to beep when you’re about 5-feet away from an obstacle, and it becomes more rapid as you get closer to it. The continuous beeping sound is produced when you’re about a foot from impact, and it will stop when you get out of the reverse. The installation is very simple because you don’t need to drill holes in order to attach the sensors. Hopkins system uses two sensors attached on either side of a replacement license plate bracket. You’ll only have to run a wire to the reverse light, and another one to the cabin where it connects to the alarm. There’s also a detailed instruction that will guide you through the installation. 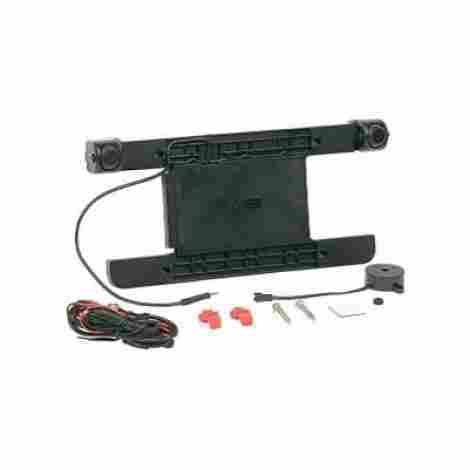 This parking sensor uses longer bolts to fit any license plate, along with fold-over wire splicing connectors and a rubber grommet to protect cables and make the wiring easier. We only have one issue with this alarm – the wire that connects to the alarm is very short, so it can’t reach the front of every vehicle type. It seems that this is a general issue with many parking sensors, and manufacturers should resolve this problem in the future. You’ll still be able to hear the alarm wherever you place it in your car, but it would be nice to have more installation options. Hopkins sensor system is one of the best options on the market, but it comes with a higher price comparing to the previously reviewed Zone Tech parking sensor. Nevertheless, if you have a few extra bucks to spend on your new shiny device, you can’t go wrong with the Hopkins system. You’ll also get a limited 3-year warranty and excellent customer support. If you're searching for a parking sensor that will help you avoid dangerous and costly collisions, you have to check out the SunValleyTeck parking sensor! This is one of the most popular cars' reverse radar systems on the market, with some great features and quality materials. With SunValleyTeck sensor you can be totally relaxed during every ride, keeping your car, you, and pedestrians completely safe. The Sunvalleytek car radar system has 4 ultrasonic sensors that attach to the rear bumper of your car. It has a double CPU and advanced chipset for enhanced coverage and better detection behind your vehicle. This parking sensor has a colored LED display composed of 3 colors: green, yellow, and red. The colors are indicating how close you are to the obstacle, with red being your last warning to stop. There’s also a sound system that produces beep sound to warn you about the danger. The sensors are water and shockproof which mean that they are meant to last. The entire radar is made of high-quality materials and carefully chosen components to prevent overheating and overloading. Additionally, the installation is as easy as it can be, you’ll only need to drill 4 small holes to fit the sensors at the rear bumper, and pass one cable to the speaker and another one to the LED display. Along with 4 sensors, wires, and a receiver, the package includes a drill bit specifically used for installation of these sensors. The only thing that could annoy you are poorly written instructions. It seems that they only give you a slight idea of what to do. Luckily, the installation is very intuitive and easy, so you’ll be able to do all on your own. This incredibly valuable car parking sensor comes with an attractive price that will make you love it! You'll also be satisfied with the ability to return the product within 30 days for a refund, no questions asked. 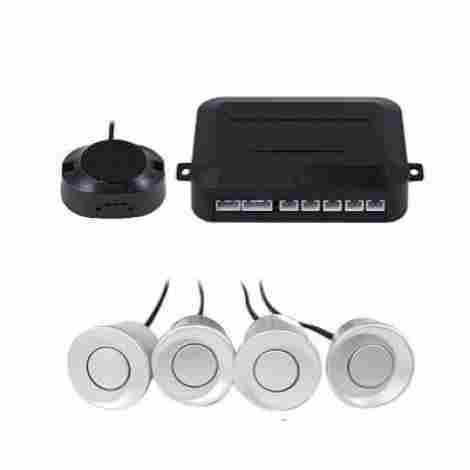 Overall, Sunvalleytek parking sensor is one of the best budget-friendly options out there. If you’re one of those people who prefer a backup camera rather than a classic parking sensor with a sound system, Esky backup camera is just the perfect choice for you! The camera will help you drive carefully and park safely. It also gives you more sense of security because you get to actually see the space behind your vehicle. The Esky camera will pick up everything behind your car, no matter if it is day or night. It has a 135-degree viewing angle and 7 infrared LED lights that ensure great visibility when the light conditions are not adequate. Not to mention that the camera offers high-quality images thanks to the great resolution (420 TV lines). You can mount the camera anywhere at the rear bumper, but we advise you to attach it on the license plate because of the better viewing angle. You can also adjust the lens for full rearview clarity. 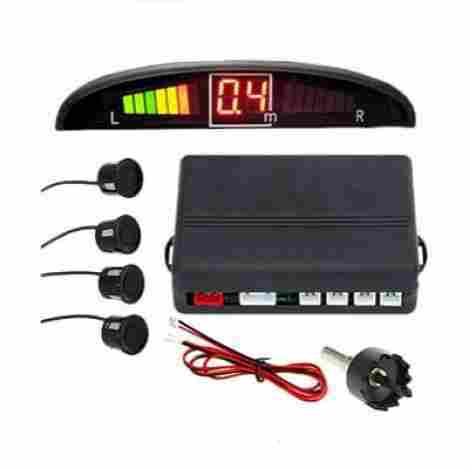 The final step includes connecting the power cable to your vehicle DC 12V power system, and the video output of the camera to the display in your car. Overall, Esky is made of sturdy and durable materials, but we were disappointed to find out that the camera is not fully waterproof. It seems that some amount of water can enter in the camera’s case, which is very inconvenient and it can damage the lens. Esky camera is an excellent choice for a parking sensor, and it comes at a reasonable price. If you still have some doubts, keep in mind that you’ll have 30 days to return the product (full refund) if you’re not satisfied with it as well as 1-year replacement warranty. Here we have another parking sensor equipped with a sound system and a LED digital screen. Ekylin is very popular on the market, providing some first-class features and great performance. It helps you park perfectly in any tight space, providing a stress-free ride every time. Keep reading if you want to find more about this Ekylin’s product. 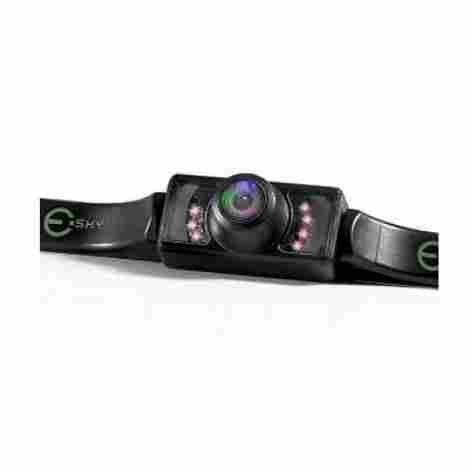 Ekylin car sensor detects everything behind your car that is close up to 8 ft. It comes with an advanced chipset and double CPU for better detection and coverage, along with a three-colored LED digital screen that alarms you when you get too close to the obstacle. The green is a color for a safe distance, the yellow is the sign of reduced distance between the car and the obstacle, while the red one warns you to hit the brake. There’s also an audible sound system that will alarm you about the obstacle with an annoying yet useful beep sound. People praise Ekylin parking sensor for its durability and user-friendly design. The installation is quite easy, you just need to drill 4 holes and mount the sensors. The only thing that could cause you a headache are short wires. This mainly depends on your vehicle type, but there were a few complaints about wires not being long enough to reach front seats. You’ll still be able to hear a warning sound dough. Other than that, you shouldn’t have any major issues. The sensor consumes a low amount of power in order to save your car’s battery. It has a waterproof construction so it can endure any weather conditions. It’s also shockproof so it will probably last for a long time. As you can see for yourself, Ekylin is an excellent choice when it comes to using a reliable and top-notch parking sensor. If you weren’t sure by now whether to purchase this product or not, you’ll be convinced when you hear that it comes with an attractive price! Are you having a hard time parking your car into the garage? Have no worries, we have just the perfect product for your needs! Striker garage parking sensor will help you park your car safely and accurately in tight garage spaces. 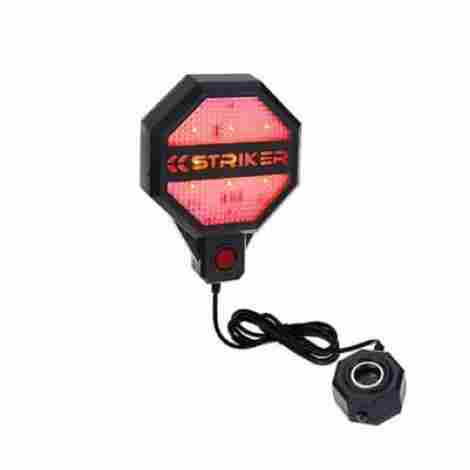 Striker uses ultrasonic pulses to determine the exact distance between the vehicle and the sensor. It offers a three-colored indicator to notify you whether you’re on a safe distance from the sensor or not. You’ll see a green light when the distance between you and the object is large, and you’re free to proceed, while yellow light will warn you to slow down. Finally, a red light will signal you to stop the car. We shouldn’t forget to mention that Striker allows you to select the exact location where you would like to park your vehicle (from 6 inches to 6 ft). The only drawback is short battery life which is quite inconvenient – the manufacturer should resolve this in the feature. The sensor is very easy to install thanks to the included double-sided tape and a velcro strap. You can mount it on any surface in front of your vehicle including walls, workbench, shelves or others. It has a bright LED light as well as an innovative range finding technology. You shouldn’t have any issues with its performance. Additionally, the sensor has a walkway lighting feature – it means that the sensor illuminates the dark garage so you can safely step out of the vehicle. However, some people think that only one sensor is not enough to provide accurate distance measurements, regardless of the used modern technology. We say that this mostly depends on the garage and its free parking space. Striker offers excellent performance, user-friendly design, and it comes with a competitive price. You just have to love this compactly designed parking sensor! It does lack some additional features to be a first-class parking sensor, but it performs quite well and it’s worth the price. Here we have a compactly designed parking sensor that will help you park your car perfectly! Frostory parking sensor offers excellent performance regardless of the part of the day, it works effectively whether the light levels are high or low. Keep reading if you want to find more about this quality product! Frostory has a distance range from 1 foot to 4.9 feet – it’s not impressive but it does the job. It comes with 4 sensitive sensors that attach to your car’s rear bumper. The sensor has a double CPU and upgraded chip for better coverage and object detection. When you get close to the obstacle the speaker will warn you to slow down with loud beep sound. As you get closer to the object the beeping sound becomes more rapid, resulting in continuous beep sound when you need to stop the vehicle. It would be nice for this parking sensor to come with an LED display, dough. The display gives us more sense of security when combined with a sound system. The Frostory parking sensor is water-resistant, and it has an anti-freeze feature. It works in almost any weather (operating temperature from -40 to +80 degrees) without any malfunctions. Overall, the product is sturdy and durable. You’ll be able to easily install it to your vehicle using an included hole saw to drill 4 holes. After you finish with the drilling process, accommodate the sensors in the holes and connect them to the speaker. Keep in mind that included hole saw isn’t the best out there, although it makes the perfect holes for the sensors. 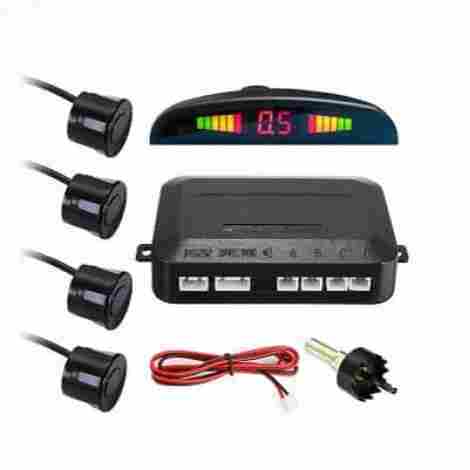 Frostory parking sensor is very popular among the users because of its great features and reasonable price. If you’re searching for a budget-friendly parking sensor, Frostory offers just the perfect one! If you want a user-friendly parking sensor that requires only a few moments of work to become fully functional, Koolertron radar system is an excellent choice! You can set it on your car’s rear bumper all on your own, and park safely for a long time thanks to this durable and well-performing product. The sensor automatically launches as soon as you shift into reverse. 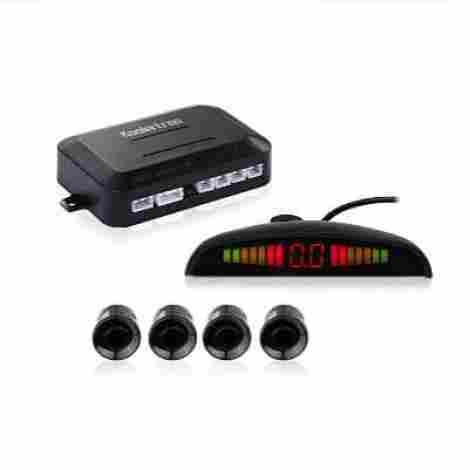 It has a LED display with a 3-color indicator and an audio signal to notify you about the distance between your vehicle and the obstacle behind it. The LED display will show green lines when you’re on the safe distance from the object, while the yellow ones will warn you to slow down. When the red lines show up on the screen you’ll need to stop the vehicle to prevent a collision. There is also a loud beeping sound to remind you about the distance between your car and the obstacle. While this feature is very useful, many users complained about it being too annoying because it doesn’t have a cut-off switch. 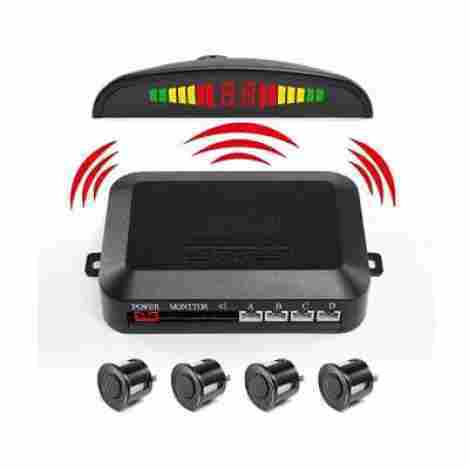 Koolertron comes with 4 sensors that go to your car’s rear bumper. You’ll need to drill 4 holes in order to accommodate the sensors, but it shouldn’t take you more than a few minutes. As a matter of fact, users praise this product mostly for easy installation and user-friendly design. The only issue we found with its design are short wires that are not suitable for all types of vehicles. Koolertron backup radar system is a compactly designed device that ensures safe parking and comes with an attractive price! If you’re on a limited budget and you’re searching for a quality budget-friendly parking sensor, Koolertron would be a wise pick. Here we have a very popular parking sensor that comes with some excellent features and provides safe parking. With Leshp sensor you’ll be able to park in any tight space while easily avoiding obstacles, not to mention that it contributes to the safety of passengers and pedestrians. Overall, we are talking about a quality product that performs excellently. Leshp features 4 ultrasonic sensors that measure the distance between your car and the obstacle. There’s a colored LED display to notify you how far or close you’re from the object. When the display shows green lines you’re at the safe distance, while yellow lines warn you to slow down. When the display shows red lines you need to stop the vehicle if you want to prevent a dangerous collision. Additionally, the sensor features a double CPU and advanced chipset for enhanced coverage and detection behind your vehicle. The installation is quite simple, you just need to drill 4 holes and accommodate the sensors. However, some people had problems with the wiring, so take into account that this might require some additional setup time. There’s a comprehensive manual tough, and it will provide a detailed guide for simple installation. What we found very useful is an auto function that turns on when you start the vehicle and turns off when the engine shuts down. Lastly, the sensors are made to endure harsh weather conditions and the device is safe from overheating and overloading thanks to the protective circuits. No doubt, you’ll get a durable product that will last for a long time. The Leshp parking sensor is definitely a wise pick considering its great performance and high quality, although it is a bit pricey. If you have a few extra bucks to spend on your new parking sensor, you should absolutely purchase this product. However, those who are looking for a budget option might want to search for another parking sensor. If you’re searching for a budget-friendly parking sensor that offers decent performance, Peak Pkcore is a great option. This backup parking sensor lacks first-class and additional features that ensure the best performance and durability, but it does the job accurately and you’ll be quite satisfied with the purchase. Peak Pkcore is specially designed for those people who don’t want all the hassle that comes with a wired sensor system. Pkcore is a wireless model that has a distance range from 1.3 feet to 5 feet, and it features a light display and a sound signal. That way, you’ll know exactly how far you are from the obstacle behind your vehicle. Keep in mind that Peak Pkcore doesn’t offer a first-class performance so don’t expect too much from this budget-friendly product! The wired sensor is more accurate than the wireless one, but Pkcore offers decent performance and it’s quite accurate. The device has 2 waterproof sensors of standard size, so you’ll be able to install them to your license plate in a few moments. There are also clear instructions if you need some additional help with the assembling part. This parking sensor is one of the cheapest options on the market. Sure, it has its flaws, but it’s also excellent for drivers that are on a limited budget yet still want to have a decent parking sensor. The most important thing about every parking sensor is the ability to detect objects accurately. We have to admit that our list is made of the best parking sensors, so they all have an excellent performance. The ones that are lagging behind are on the bottom of our list yet they still offer decent performance. However, sensors on our list differ in terms of a distance range so we also assigned points according to their ability to detect distant objects. For us, it was important to take into account all the features that contribute to the stability and durability of every parking sensor on the list. For example, sensors that are water and shockproof are ranked higher on our list because they don’t require the purchase of an additional protective casing. The same applies to every feature that makes a product durable and extends its life. While it might seem that drilling a few holes in a rear bumper is an easy task, the thing is way more complicated. You need to drill the right holes, to perfectly do the wiring part, and connect the cables to a display or a sound system. It’s actually a tricky task, and we wanted to be sure that you won’t spend hours on it. Additionally, the products that come with useful instructions are placed higher on our list. Last but not least, the balance of cost and value was an important factor in our evaluation. Parking sensors that provide excellent value for money are ranked highly on our list. Of course, we had to include some pricey products that have an outstanding performance along with budget-friendly options that offer only decent quality because we had to think about every user’s needs. However, we ranked the products according to their overall performance, quality, and price, providing an in-depth review for each one of them. 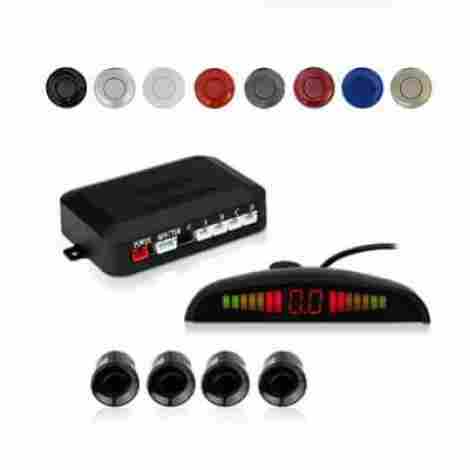 First and foremost, identify the type of vehicle for which you’re buying a car parking sensor. This is very important because some vehicles already have built-in parking sensors, and you want to find a better aftermarket option than the one that your vehicle already has. On the other hand, you’ll want to know how long cables do you need for your vehicle. Some parking sensors have short wires, and you don’t want to end up with a half-installed device that beeps on your back seats. Which type of parking sensor do you need? Do you prefer wireless or wired sensor system? What about performance and design? You can choose a device that offers both a LED display and a sound system, or you can go for a cheaper option and get the one that produces a beep sound and nothing more. Every option has its pros and cons, thus deciding for the proper parking sensor is the mater of personal preference. In case you have a few extra bucks to spend on a new parking sensor, you should go for the one that has all the possible features! Think about the overall design of every parking sensor. Everybody wants a durable product that will last for a long time and perform perfectly in any given situations. However, every product has its flaws and you need to think about them before you make a purchase. Some people can’t deal with a bothersome installation of the wired sensor system while others only need a user-friendly interface of the display. You’re maybe one of those drivers that don’t want to drill holes in a rear bumper and need a parking sensor that attaches to a license plate. Think about all of the above if you want to buy a perfect parking sensor for yourself. Q: What is a parking sensor? A: A parking sensor is a little device designed to help you park your car more accurately. It usually goes at the rear bumper (but it can be also placed in front of the vehicle) and connects to a LED display or to a speaker inside of your vehicle. That way, it notifies you about the distance between your vehicle and the obstacle on the outside. For example, many parking sensors feature a three-colored LED display. A green color lights up on the screen when you’re on the safe distance from the obstacle, while a yellow color warns you to slow down. Finally, a red color is your last warning to stop the vehicle in order to avoid a dangerous collision. Q: Which parking sensors are better, wireless or wired ones? A: It depends on the used materials and included features. You can install a wireless parking sensor within a few minutes without too much effort, while a wired one could require more time and patience. However, a wired parking sensor has a better connection to the sensors, so it measures the distance between your car and the object more accurately. Truth to be told, the differences between them are not as big as they seem, so it all comes down to the matter of your personal preference. Q: Where should I install a parking sensor? A: You can install a parking sensor on the front or at the back of your car. In each case, you’ll probably need to drill holes in order to accommodate the sensors. The installation is usually very simple, especially if you get comprehensive instructions along with the product. Some parking sensors even come with a hole saw, specially designed for particular sensors. Furthermore, there are parking sensors that go on your license plate, and they require even less effort and installation time.